Today Molly turned 4 years old. 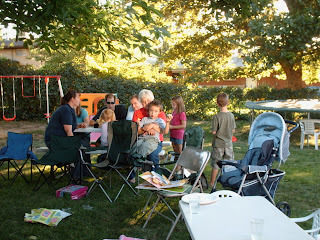 We had a bbq at our house yesterday since today is her birthday and yesterday was Labor Day. Of course, I made a cake for her and some cupcakes. She was very excited about them. She loves the gifts she received. Thanks to everyone who came. I hope everyone had a good time. Also should wish a happy birthday to everyone who will be having birthdays this month besides Molly. So happy birthday to Brianna, Russ, Joshua (his 1st! ), and Autumn! 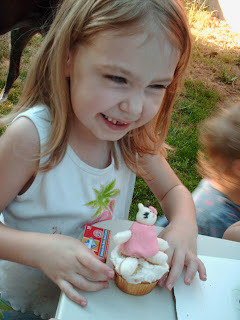 Here are a few pictures from the bbq (and of the cake). 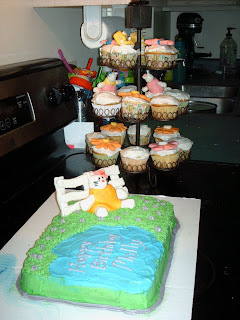 Molly's cake and the cupcakes. Probably should have taken a picture of just the cupcakes. 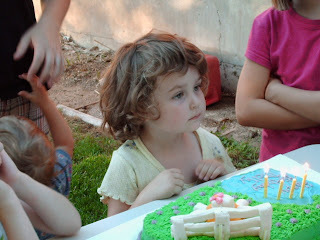 Molly waiting for everyone to finish singing so she can blow out her candles. Emma was happy to get a cupcake. Some just hanging out and chatting after eating. 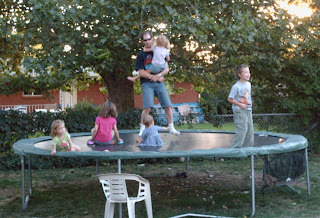 Below: Dave on the tramp with some of the kids, and video of Molly singing as she plays with one of her gifts.